Not surprisingly, Bell Plastics in Hayward acquired a Sinclair Dinosaur in 2016. Bell Plastics is known for its multitude of fiberglass statues including several Muffler Men, Doggie Diner heads, and other fiberglass giants! The owner Brice Kennedy collects fiberglass statues. 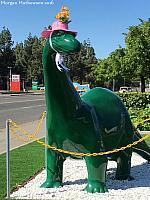 They have a small Sinclair Dinosaur proudly displayed up on a pole, looming over several other fiberglass statues. Just south of Victorville is Hesperia, located on your way up Interstate 15 towards Las Vegas. 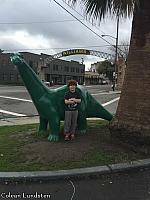 About four miles east of 15 on Main Street, they have a pristine Sinclair Dinosaur. 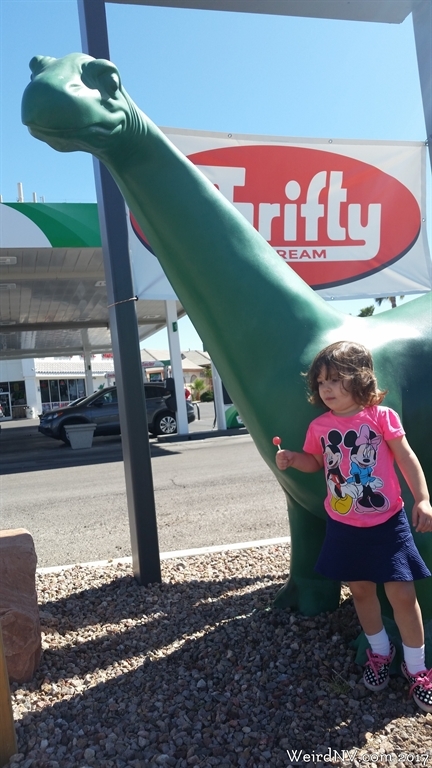 Their Sinclair Dinosaur is located behind a low white fence in front of the convenience store portion of the service station appropriately called "Dino Mart". It is freshly painted and in great condition. It is the only dinosaur I've seen besides the Bell Plastics one that has the head coming off and to the right, rather than the left. Poor Man's Bronze in Jackson has a replica of a Sinclair Dinosaur that hangs out there, possibly also with a giant chicken. 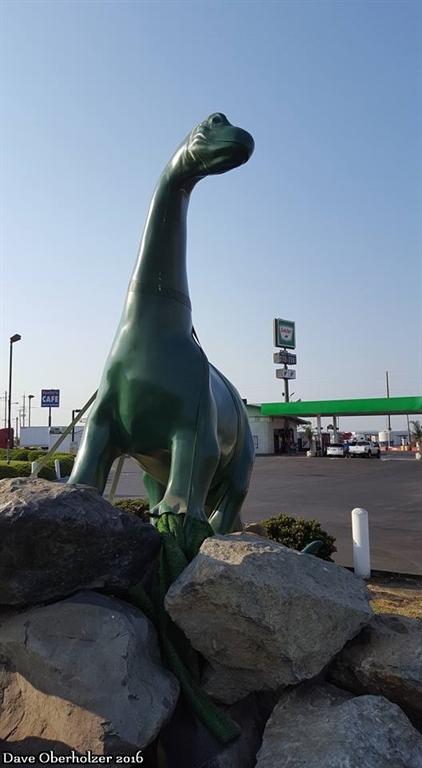 In addition, we've also identified Sinclair Dinosaurs in Auburn, Campo, Farmersville, Indio, Placerville, Williams and Yuba City! You can see Cole Lundsten showing off the Williams Sinclair Dinosaur! It is perfectly placed to get the city's name bearing arch in the background.